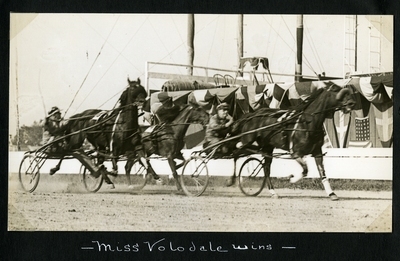 Black and white action photograph of bay mare, Miss Volodale wearing saddle number two, W. Utton up, claims the first place win in the first heat of the Free for All Pace at Cold Spring Park, Rochester, N.H., during the Saturday, October 1, 1938 Rochester Fair. Finishing in second place, black gelding, Harry G. wearing saddle number five, F. Safford up. Chestnut stallion, Royal Napoleon wearing saddle number four, L. Toole up finished in third.